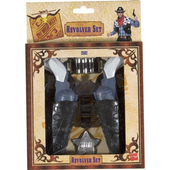 The high quality Cow Girl Diva costume consists of a brown dress with fringe detailing, a belt with star buckle and a pair of gauntlets. 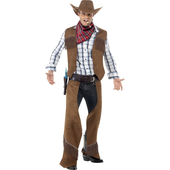 Also included in this Western costume is a red headscarf and a silver rope. To complete the look a brown cow girl hat is also included. Great value for money. I found the fit to be accurate to the sizing listed, material is nice and comfortable. Not too short, it's a little longer on me than in the picture and I am 5'8. Delivery came faster than expected, really quick so 5 stars for that.